DZHUS is a conceptual wear brand launched in 2010 by Ukrainian designer Irina Dzhus. Vanguard yet utilitarian, DZHUS' visual identity derives from innovative structural solutions. The brand's design concepts are based on interaction and transformation of construction modules, aimed to create new aesthetics of the form – unique and virtually archetypical at the same time, categoric but variable. Designer Irina Dzhus is inspired for experimental cut with industrial leitmotif by the monumental heritage of the totalitarian epoch: industrial objects, architecture of constructivism, functionalism and brutalism. Brand's monochrome collections are created in organic fabrics and jersey. DZHUS is a vegetarian-friendly brand. All the products are made of violence-free materials. DZHUS clothes are characterized by alternative finishing of fabrics: visible seams, raw edges, edging that becomes an independent graphic element itself, overlock fringe and many other conceptual techniques which provide a unique visual identity of the brand. The brand's collections have been presented in Paris during the fashion week, as well as within Ukrainian Fashion Week, Mercedes-Benz Kiev Fashion Days and Prague Week of Fashion and Design - Designblok. 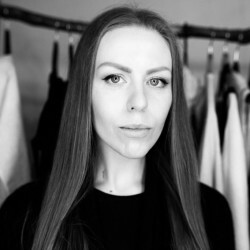 In December 2015 DZHUS brand became the finalist of International Woolmark Prize. DZHUS' customer is a perfectionist who longs for an uncompromisingly complementary form for her own spiritual substance.